If you made the decision to have a staycation this summer, your shrewd decision has certainly paid off. The UK has experienced one of the hottest summers on record. Most British summers have sunny spells that are no longer than 48 hours, and you may be lucky to get more than three of these spells throughout the whole season. Not this year! The scorching summer of 2018 has shown us what British summer is capable of. And if you ignore the fact that this is probably due to the damaging process of climate change that we’re not doing anything about, it’s been a fantastic summer. If this is what we can now expect every year, you may also start thinking about cutting costs with a staycation of your own. Especially when you may need a visa to use the Channel Tunnel from next year. A staycation shouldn’t be seen as a compromise, however. Au contraire, a staycation may just be the best holiday decision you ever make. More than half of Brits are planning a UK-based summer holiday this year. And there’s plenty of places to holiday in these isles of wonder. This article is going to run through what you need to pack for a staycation, some style tips and some destination and activity tips. There’s much more to these lands than you may think. If you’re going to holiday in the UK, there are a few things that you will need that you wouldn’t normally take on a holiday abroad. The main reason being, this is still the UK. Despite the fact we’re in the midst of a heatwave, one thing you can always rely on is that you can’t rely on the weather forecast. A waterproof jacket. This one goes without saying. You could have ten different forecasters tell you that it won’t rain during your staycation, but you should still bring one. The British weather is incredibly emotional and plays completely by its own rules. Don’t be caught out by one of its mood swings. A lightweight waterproof jacket is ideal, ready to deploy whenever you need it. Wellington boots. These will less likely be called upon than the waterproof coat but its still definitely worth bringing them if your staycation is going to be an active one and if you have the space (and a must if you’re camping!). For everyday use, you can’t go wrong with some cool and casual women’s canvas shoes. The key to holidays in Britain is layering. Even if the day has been an absolute scorcher, it is still liable to get a bit nippy in the evening. If you’re staying by the sea, this is definitely the case and some knit cardigans, thin jumpers and other layers will be your friend. Consider a lightweight patterned scarf too. Picnic gear. There are so many places to enjoy a picnic in the UK that you should make sure you don’t leave your picnic gear at home. A nice cool box that’ll keep your food and drink cold is essential. Think about packing a gazebo if you’re going camping. This will also come in handy for future garden parties, barbecues and so on. Other than these items, which you may not think to pack for any other type of holiday, pack like you normally would. Make sure you’ve got plenty to keep you entertained, some summery clothes and all your essentials. In terms of your staycation style, we have some advice for what you should bring along or look to get in the shops before you go. Dressing for a staycation here in the UK is quite the challenge but can always be done. Let’s begin by looking at one of the UK’s most frequented staycation destinations, the seaside. Not all of Britain’s beaches warrant a bikini. And if you’re not going in the height of summer, you may experience some stronger gusts and cooler temperatures. Layering your outfit is the best way to make your trip to the seaside look chic. For example, consider some nautical clothes such as Breton striped clothes, or anchor prints. Wear them in shades of deep or light blue, paired with white jeans and a black leather jacket if it’s particularly breezy. A great mixture of biker-chic and nautical class. Another good general rule is to steer towards prints and patterns instead of block colours. Holidays allow you to be a bit more flamboyant, but don’t take it too far. Your usual sophisticated, high-fashion outfits should stay at home on a staycation. Keep it simple, keep it comfortable and keep it casual. On your staycation, it shouldn’t take you long to pick out and wear an outfit. You just want to throw something comfy and cute on and focus on relaxing and enjoying yourself. Keep your clothes fun and always bear any layers that you can add in mind. Think playsuits, rompers, maxi dresses and stylish accessories. Try and look for clothes that flow. They’re a great mixture of elegance and comfort and give you an effortlessly stylish look. Shop our Women’s Summer Sale for all your staycation shoe needs! Most people feel motivated to have a staycation for financial reasons. Sometimes we just can’t justify the cost of flying abroad. However a UK staycation is more than just rainy camping trips, or sleeping in one of those huts at Margate beach and having a glass of white wine with your fish and chips. The UK has plenty of beautiful holiday locations and plenty to do. Here are our tips to make your staycation great. Yorkshire – This northern county should definitely be on your radar this summer. For 9 months of the year, it’s fairly wet and chilly here but for the months of summer, Yorkshire becomes the green and pleasant land that they mention in those hymns. Yorkshire is postcard Britain, with quaint rural villages, a stunning coastline and a load of moors and dales to explore. The Scottish Highlands – You’d be forgiven for thinking that there’s simply nothing to do in the Scottish Highlands. Breath-taking scenery aside, there are extreme sports activities, wildlife parks, adventure parks and much much more. You can hunt for the Loch Ness Monster or immerse yourself in the history of the Highlands. Cornwall & Devon – Perhaps the only part of the UK that can be legitimately annoyed if they don’t get much sun in the summer, the coastal counties of Devon and Cornwall are a staycation favourite. Scores of gorgeous beaches, charming market towns with cobbled streets and no shortage of delicious food makes these counties essential visiting. Whether you’re camping or you hire a villa by the beach, these counties are worth staying for. Plus, Cornwall is great for surfing, if that’s your thing! Northumberland – One of the more unusual suspects on our staycation location tips, Northumberland is low-key, off the radar and absolutely divine. It has amazing, clean beaches, islands to explore and historic castles and buildings to learn about. They filmed a fair amount of Harry Potter in Northumberland. Should tell you everything you need to know. Isle of Wight – As close to going abroad whilst staying in the UK as you can get. The Isle of Wight can only be accessed via ferry and if it’s an escape you want, an escape is what you get. There are loads of cycling and walking trails to adventure down, water sports to try out and quiet villages and towns to meander around. Eat by the sea for some fresh seafood and enjoy their expansive beaches. You may be thinking about how you’re going to keep yourself entertained on a staycation. We’ve got some low-cost activities that you can do which won’t break the bank. Head to the seaside – Having a beach day is a welcome change of scenery if you’re an urban dweller and it will truly make you feel like you’re in another country. The Isle of Wight, Northumberland, Devon and Cornwall all have amazing beaches to visit. 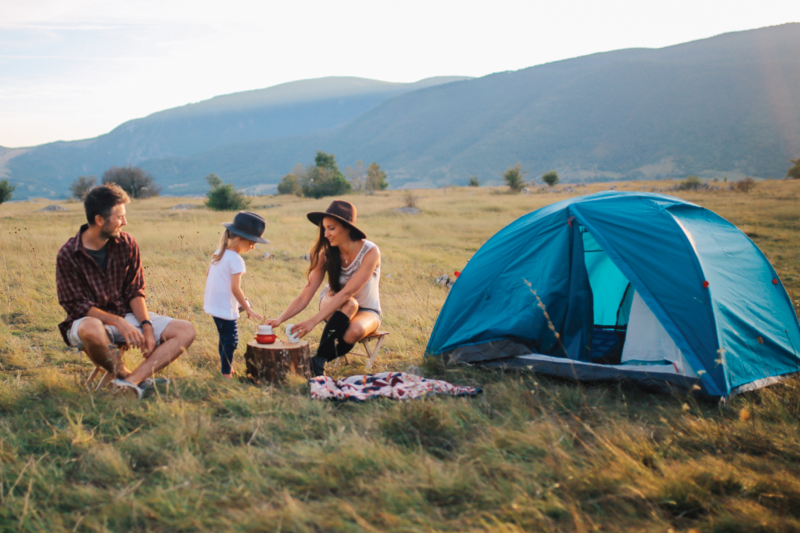 Camping – Get back in touch with your wild side and camp under the stars on your staycation. This is as cost-efficient as holidays get and if you enjoy camping, you’ll love camping in the UK. If you’re not a big camping fan, try glamping instead. You’ll save loads of money by not booking accommodation or flights, so get yourself a big tent, loads of cushions, a space heater and a generator and there you have it, a home from home. Explore a city – Did you know there are there cities in the UK except the one you live in? Scratch that, have you ever even explored your own home city? A great low-cost activity on a staycation is to explore a nearby city, or your own, like a tourist would. There’s got to be a reason why so many foreign tourists choose to holiday here every year, see what all the fuss is about! Explore the countryside – The great British countryside is filled with hidden gems and places to explore. Check out some National Trust sites around the UK and enjoy a picnic whilst you’re there. If you’ve got kids with you, there are plenty of activities at these places for children to do. If not, a sprawling country manor is great place to walk around, sit down and unwind. There you have it, all the tools and tips you need to make your staycation a success. So many people spend ages working for and planning a foreign holiday and as great as they are, there are so many places to see and things to do right here on home soil. Whether you’re having a staycation to save on costs or to enjoy the great weather we’re having, be thankful that you live in a fantastic holiday destination, even if you don’t think that you do! Head over to our summer sale for loads for great deals before you take a holiday. No matter where you’re going, you won’t find top quality shoes for a better price than here at Shoe Zone. Whether you need some new ladies’ sandals for your holiday, or some women’s trainers or canvas shoes to beat the streets in this summer, we’ve got you covered.